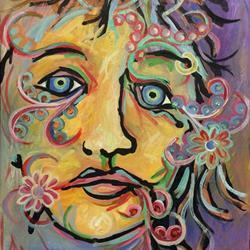 Profile of Artist Lindi Levison | Organic. Instinctive. Spontaneous. Lindi produces art that is sometimes thought-provoking, often colorful, and usually meant to be either fun and exciting, or totally relaxing to the viewer. Let art relax your mind, soothe your soul, and bring peace and stillness to your life. Indeed, it is the only thing that can. Nearly 800 paintings sold world-wide since 2001, from the artist formerly known as 'FALGE'. -- To see current work, click here.